How to use mophie/rammore Space Pack v2 for ipad? The Rammore Space Pack from Mophie® increase battery life and offer additional storage. Its quite easy to wear out your iPad’s battery within a day. What’s more,it is a smart case cover to protect your iPad! However , how to use the mophie/rammore Space Pack v1 for your ipad? Prepare a formatted SD card, Windows7 can not format 32G SD card to FAT32 format. 64G SD card default format is exFAT, if you want to get first-compatible with the sd card, then the package is formatted as NTFS, and convert to FAT32 format with software. Or formatted to HFS+ for Apple-compatible format(high speed), but the disadvantage is must be used in the MAC driver is installed in the PC. Keep the SD card in unlock state. Sets the Rammore reader installed on Apple products, the reader sets the switch to the reader Logo. After installation, your Apple product will automatically open the App Store, if not open it yourself and search iFlashDrive and click install. If you frequently plug your RamMore on iPad, it may cause your iPad turn in the protected status, iPad does not support external devices in this state, you need to restart iPad. Open the i-FlashDrive, click on the external memory can directly browse the contents on the SD card. i-FlashDrive is a file manager, it can do copy, paste, move to your files and so on. Click the file directly which you are going to play, no need complex operations, very easy to use. The following is the i-FlashDrive support direct play files. It supported video file types are AVI, FLV, MP4, MOV, MPV, M4V, MKV, MPG, RM, RMVB, TS, WMV. Does not support the audio format AC3/E-AC/MLP files. It supported audio file types are MP3, CAF, ACC, AIF, WAV, AIFF, M4A. Supported image file types are BMP, TIF, TIFF, XBM, GIF, ICO, CUR, JPG, PNG. Document file types supported TXT, HTML, KEYNOTES, NUMBERS, PAGES, PDF, PPT, DOC, XLS, RTF. For unsupported file formats, to do as the following: copy the files from the SD card into the internal memory, and then click Open can be used to support the format with third Party Apps which can play. i-FlashDrive has its own music player, allows you to easily play music in SD card and create a playlist. Transfer files to other iPad like Flash-Disk. RamMore can be used as a Flash-Disk, easily transfer files between iPads. RamMore can be used as a backup disk, so you don`t need to afraid of accidentally losing your contact information with others. RamMore can protect your personal privacy, encrypt important files. It is a beautiful iphone case exactly as you see in the picture. The case is designed to fit the iphone 5. It will protect your iphone from getting damaged. 3.This is non-OEM generic product. 5.Made of durable and soft plastic material that protects your phone and offers an excellent hand feel. 6.Slip your beloved phone into this case and instantly experience the comfortable sensation touch and the look of sophisticated styling. 7.Perfect cutouts and slim design allow you to maximize the functionality of your phone. 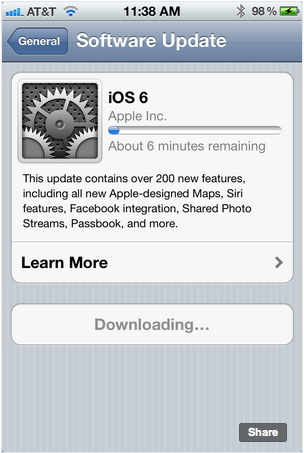 Today , Sep.20,Apple iOS 6 officially pushed to their users through OTA, the long-awaited official version is finally released. Many Apple users are looking forward to with much hopeful, but you need to prepare accordingly before upgrading. Before upgrade ,you first need to backup in iTunes, if your device is jailbreaken, then you need to revert to the original jailbreak status , please make the iTunes update to the latest version 10.7, now it is ready, the time for you to do upgrade operation. What the iOS 6 Software Updated?